PfSIP2-N localizes to P. falciparum chromosome end clusters. (A) IFA detects discrete perinuclear PfSIP2-N-HA signals in late trophozoites (LT) and early (ES) and late (LS) schizont stage 3D7/SIP2-N-HA parasites. The expression cassette is schematically depicted on the left. 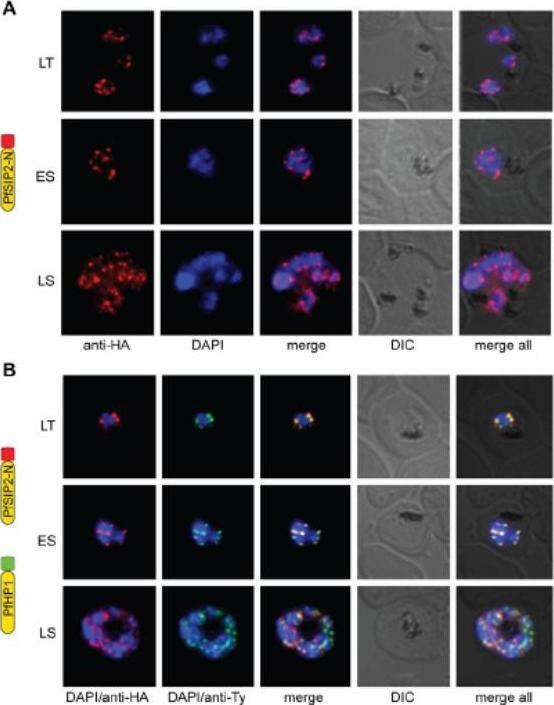 (B) Co-localisation of PfSIP2-N with PfHP1-containing subtelomeric heterochromatin in late trophozoites (LT) and early (ES) and late (LS) schizonts in the double transgenic parasite line 3D7/SIP2-N-HA/HP1-Ty (over-expressing both proteins as epitope-tagged versions simultaneously). Expression cassettes are schematically depicted on the left. Indirect immunofluorescence (IFA) microscopy identified discrete PfSIP2-N-HA foci at the nuclear periphery with increasing numbers of foci in replicating stages (A) consistent with chromosome end clusters. PfHP1 is a heterochromatic marker. Both proteins co-localized at the nuclear periphery (B). Flueck C, Bartfai R, Niederwieser I, Witmer K, Alako BT, Moes S, Bozdech Z, Jenoe P, Stunnenberg HG, Voss TS. A major role for the Plasmodium falciparum ApiAP2 protein PfSIP2 in chromosome end biology. PLoS Pathog. 2010 6:e1000784.